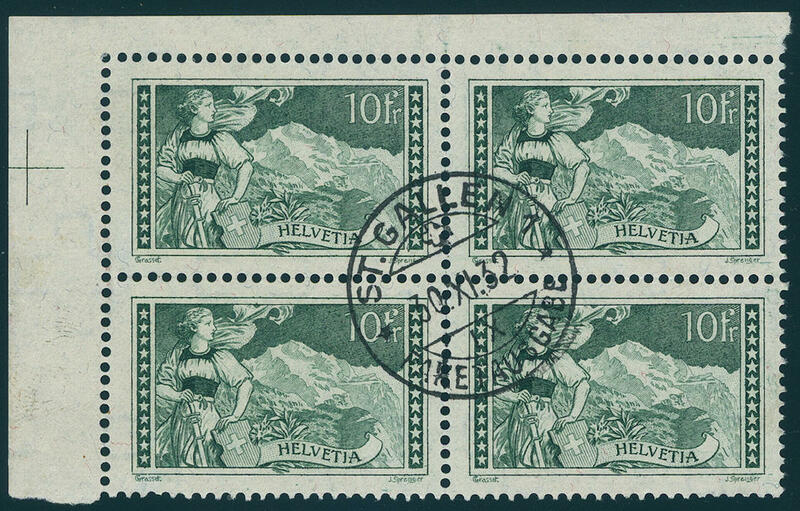 4151 I/III Pro Juventute precursor series 1912, wonderful fresh colors and in perfect condition unused with original gumming, key value with photo certificate Rellstab. Michel 500,- €. 4152 / IIIUMw 10 Cmi. Pro Juventute-forerunner 1912, Italian inscription, wonderful having bright colors block of four, in the middle horizontal unperforated, upper pair with clean small hinge, lower pair in perfect condition mint never hinged a particularly beautiful and very scarce unit for the advanced Switzerland-collector! 4153 ⊙ 123DD 10 Fr. 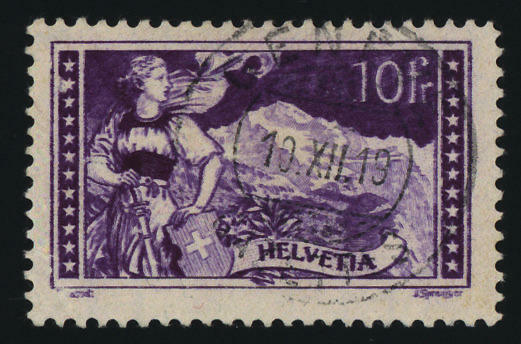 Mountainscapes 1914 with clear displaced double impression, in perfect condition centric cancellation \"GENEVE\", an especially nice copy this Switzerland rarity, photo expertize Zumstein. Michel 1600,- €. 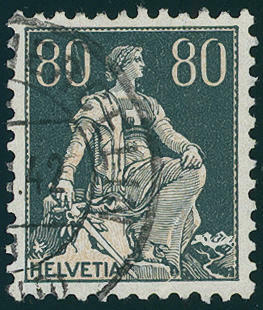 4154 ⊙ 141y 80 C. Helvetia with sword, coated granite paper, smooth gum, fresh colors and neat cancelled in perfect condition, photo expertize Liniger. Michel 380,- €. 4155 ⊙ 141y 80 C. Coated granite paper, smooth gum, small objection, neat cancelled, photo expertize Eichele. Michel 380,- €. 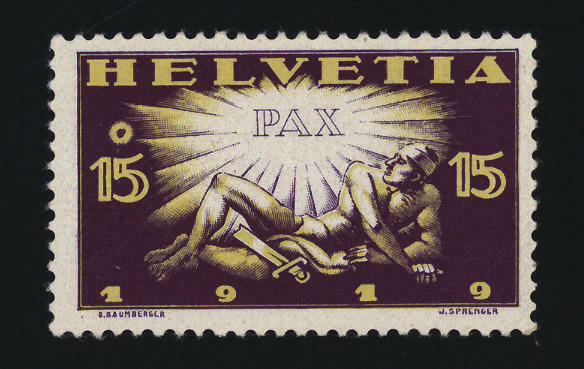 4156 148ABART 15 C. Peace contract 1919 with extremely rare variety \"bordered circle over left numeral of value\", in perfect condition unused extraordinarily distinctive and neither in the Michel, still in the Zumstein special catalogue indicates. Photo expertize Bach. 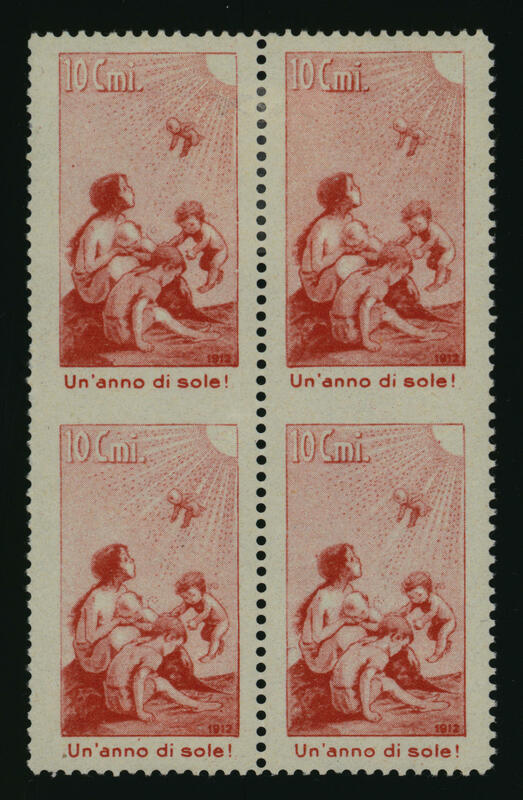 4157 ⊙ 152 30 C. Airmail 1920 with red airscrew overprint, fresh colors with clean Flags stamp in perfect condition, photo expertize \"genuine and immaculate\" Eichele. Michel 1400,- €. SBK 2.250,- Sfr. 4158 ✉ 169xaAbart 30 Rp. 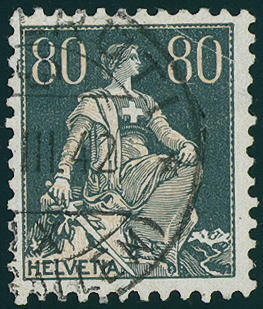 Blue on chamois paper, Tell bust picture, complete clearly offset on face applied with glue to correctly franked cover from \"LAUSANNE 18. XII. 34\" to the Haag / Netherlands. A spectacular variety and in this use a top piece for the sophisticated special collection! Photo expertize Eichele. 4159 ✉ 191x 1 Fr. 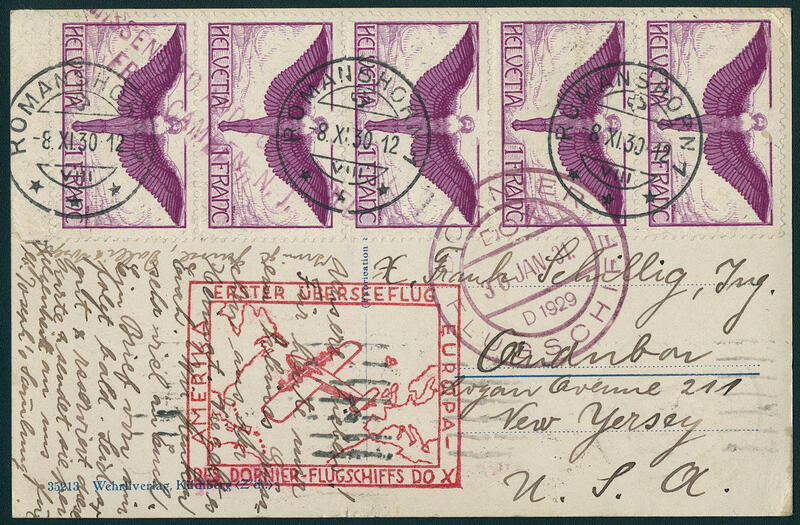 Airmail, ordinary granite paper, smooth gum, vertical strip of five this good issue as scarce pure multiple franking on very nice DOX airmail postcard from \"ROMANSHORN 8. XI. 30. \" with two ring cancel \"DORNIER airship 30. January 31. 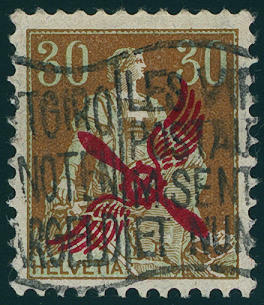 \" and red special confirmation stamp to New jersey / USA with on the back transit stamp from Friedrichshafen, as well Rio de Janeiro. 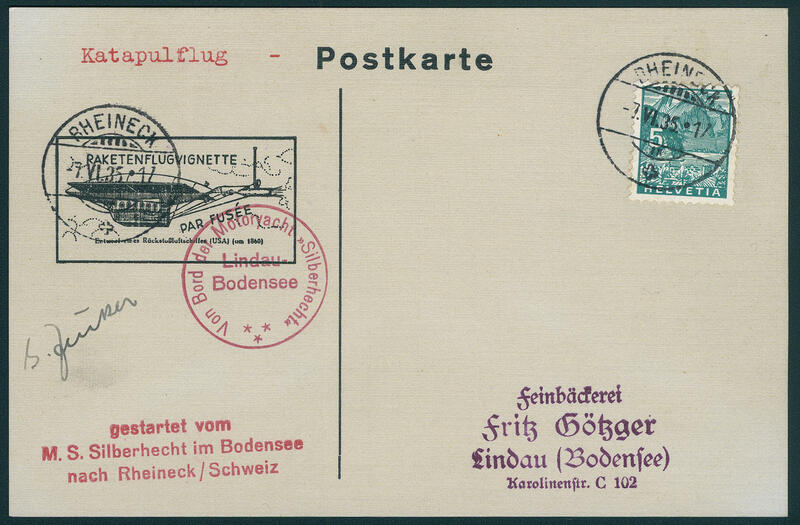 A lovely airmail postcard with very rare franking! 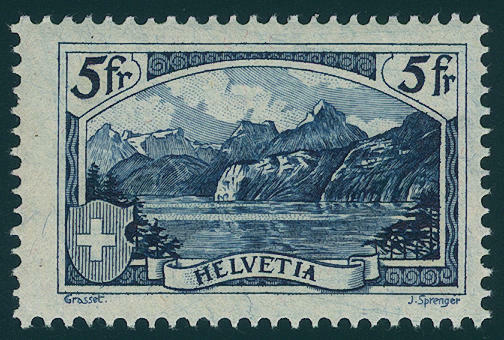 4160 226/28 Mountainscapes, all three values fresh colors and very well perforated, in perfect condition mint never hinged, without any signs. Michel 1100,- €. 4161 ⊙ 227 5 Fr. 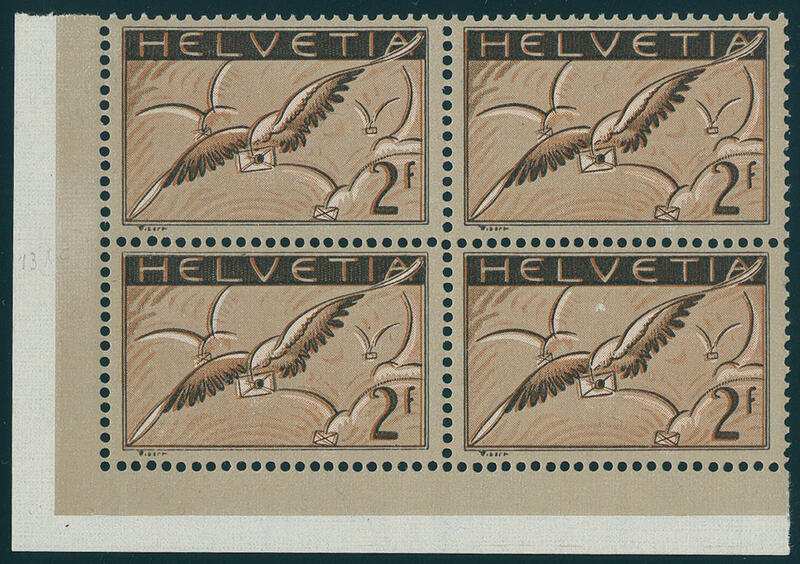 Landscapes 1928, faultless block of four, perfect centric and neat cancelled SBK 275,- Sfr. 4162 ⊙ 228 10 Fr. 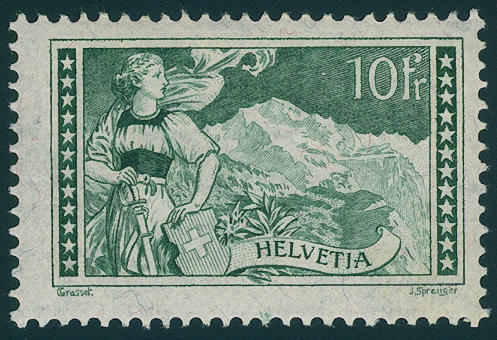 Landscapes 1928, block of four from the left upper corner, in perfect condition centric and neat cancelled SBK 300,- Sfr. 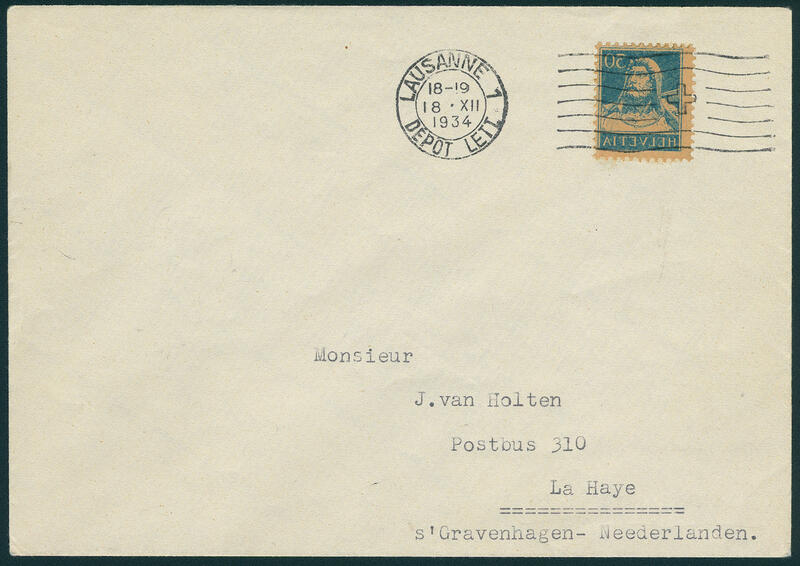 4163 ⊙ 233/34z Airmail 1933, chalky paper, wonderful outstanding set with two all perfect, so-called crescent postmarks from \"conference DE (MONTREUX) 20. VII. 36\", photo expertize Eichele. 4164 245zAbart 2 Fr. 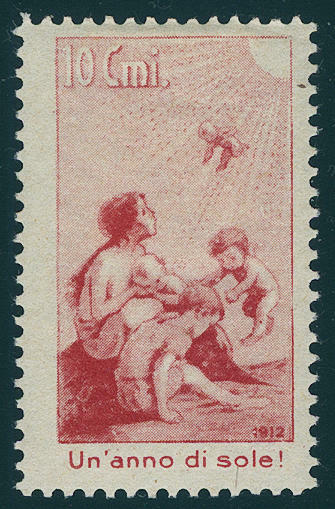 Airmail 1935, ribbed gum, block of four from the left lower corner of the sheet with variety \"background the two left stamps shifted\", in perfect condition mint never hinged (Zumstein catalogue no. 13 to 1.10. ) Zumstein 1000,- Sfr. 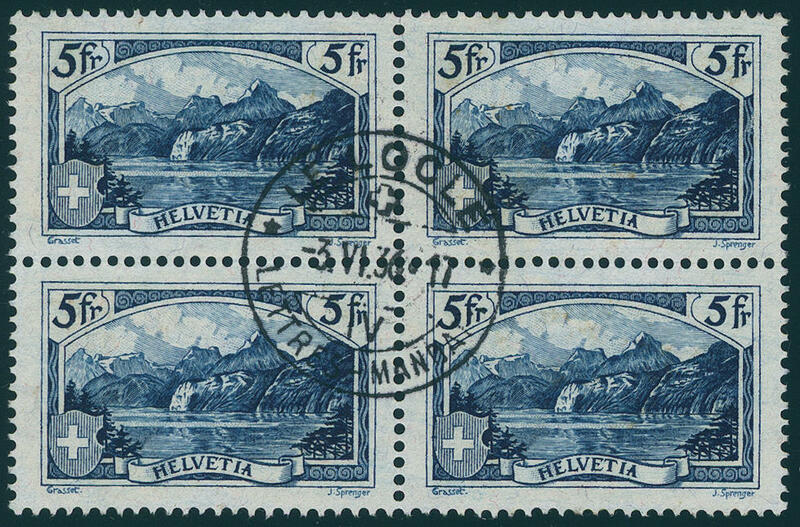 4165 259/61SU Gotthard train 1932, all three values as scarce single proofs on hand made paper from the gift booklet in perfect condition. Rare! 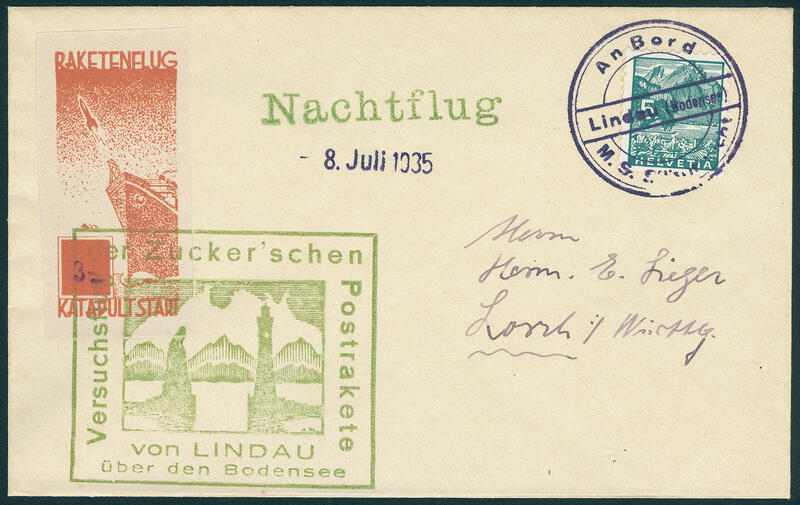 4166 ✉ 271 5 C. Landscapes 1934, in perfect condition on very nice rocket mail letter from \"LINDAU (Lake Constance) \" to the night flight from 8. 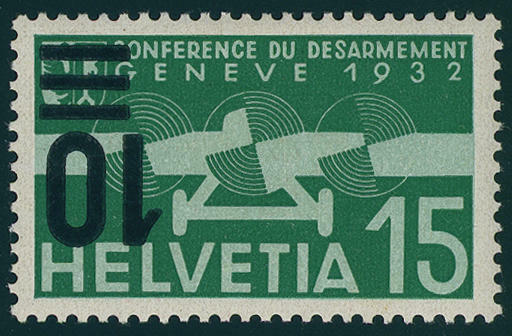 July 1935 with accordingly unperforated rocket flight vignette and green special confirmation stamp to Lorch. Rare! 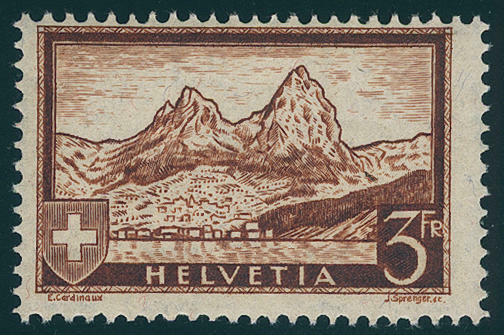 4167 ✉ 271 5 C. Landscapes 1934, in perfect condition on decorative rocket mail letter from \"RHEINECK 7. VI. 35. \" with accordingly unperforated rocket mail vignette and signatures of the rocket pioneer sugar and captain Nail to Lorch. Rare! 4168 ✉ 271 5 C. Landscapes 1934 on decorative rocket postcard from \"RHEINECK 7. V. 35. 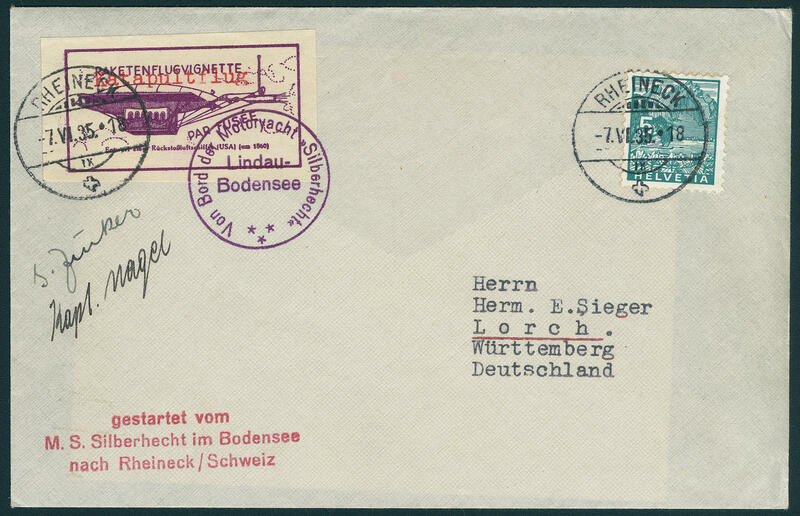 \" with imprinted rocket mail vignette and signatur of the rocket pioneer sugar to Lindau. Rare! 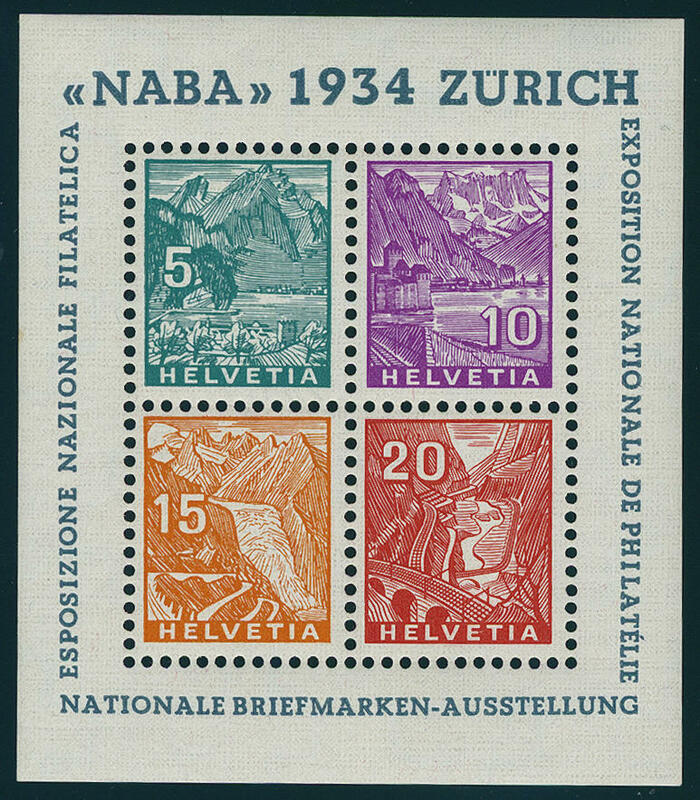 4169 Bl.1 NABA-block 1934, fresh colors and in original size, in perfect condition mint never hinged, without any signs. Michel 800,- €. 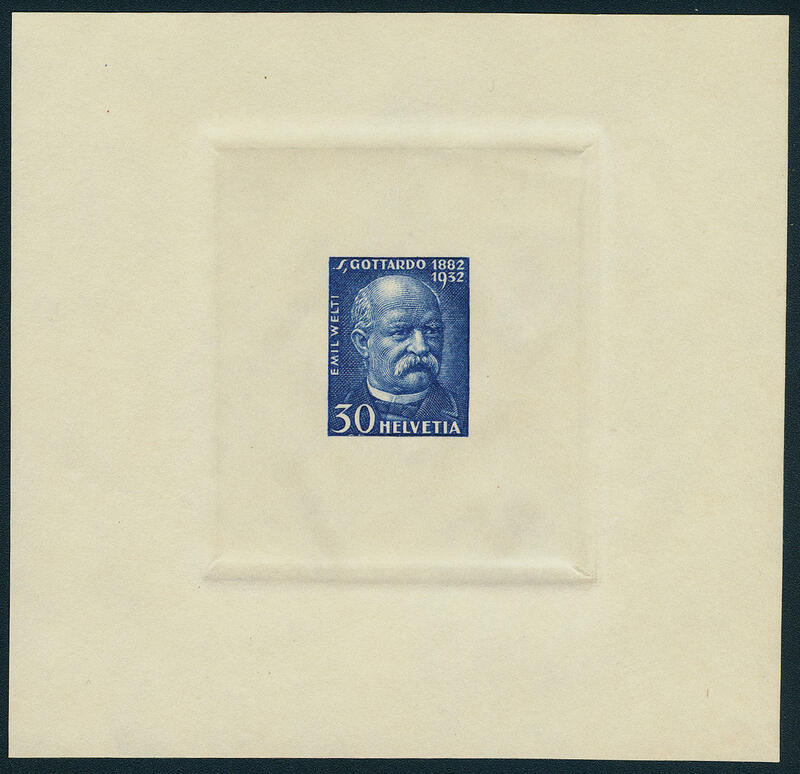 4170 286K 10 C. On 15 C. Airmail 1935 with inverted overprint, fresh colors and very well perforated, in perfect condition unused with original gumming. 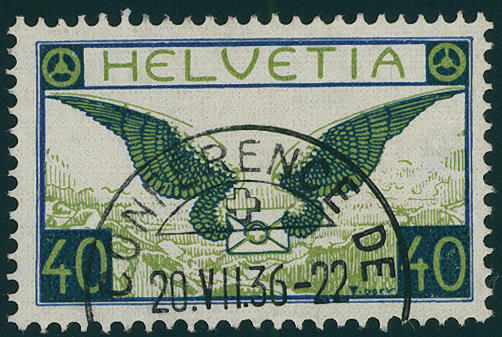 With this inverted overprint was only a sheet near the mobile post office the Baden trip found. 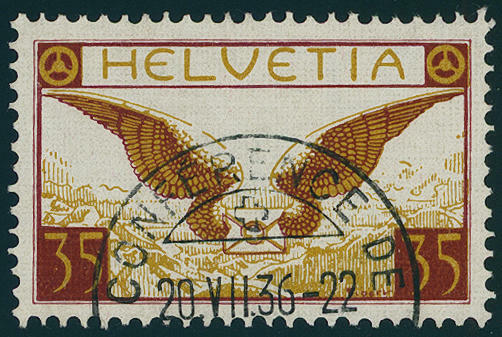 A Switzerland rarity for the advanced special collection! Photo expertize Eichele. SBK 7500,- Sfr.